There's just something fun about pouring a bunch of ingredients into the big silver bowl, and stirring them up with your hands. Forget the spoon. It's more like playing this way. On the menu is granola, yummy Peanut Butter Granola. I remember making this as a child, and it's still just as good. 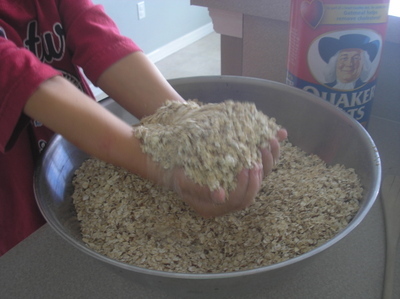 You begin with lots of rolled oats, then add your favorite nuts and seeds, and like I said, stir it up with your hands. Then you heat the wet ingredients in a saucepan until they are all melted and blended together, and your kitchen is smelling nice and nutty. Next, pour the peanut butter mixture over the oat mixture, and mix it thoroughly--now's when you have to use that spoon. 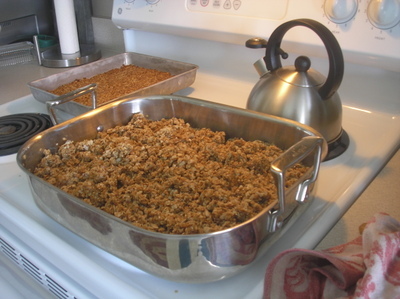 Pour one-third of the granola at a time into a roasting pan, and roast it at 350 for 20-30 minutes, stirring after every 10 minutes to ensure even color. When you've finished roasting the final batch, leave the pan of granola to cool on the stovetop, and every time you walk by, you'll pop a crunchy, peanut-buttery chunk into your mouth. And so will those little boys. And so will their daddy. Yummm. 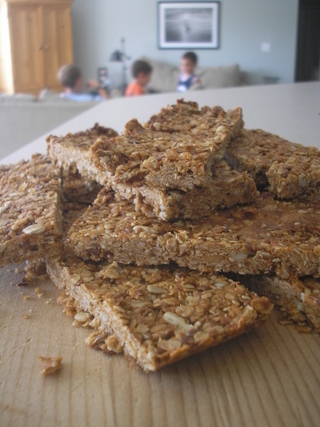 Oh, and this time, just for kicks, we pressed some of the granola mixture into the bottom of a pan, roasted it, and out came home-made granola bars! Double yum. 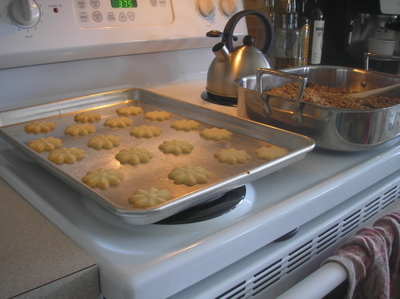 Now, while you have six clean little hands in the kitchen, you might as well make some cookies, too. Especially when you've had the coolest cookie-making tool ever squirreled away in your cupboard for years, and you've never used it. A cookie gun. How could I have been holding out on my boys for this long? Bah! I have no idea, but the cookie shooter was a hit from the word go. 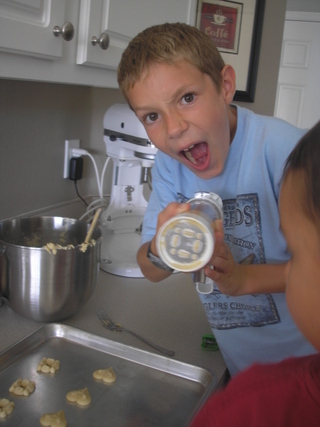 This guy's the meanest cookie maker this side of the Divide. And, boy, does he know how to use his gun. These cookies come out of the oven all crispy, crunchy, chewy, and definitely vanilla-y. And, since they are small, you find yourself eating four at a time without a smidgen of guilt. Cookies in the jar, granola in the pantry, and a pile of granola bars on the counter for whenever those boys are hungry. Triple yum. 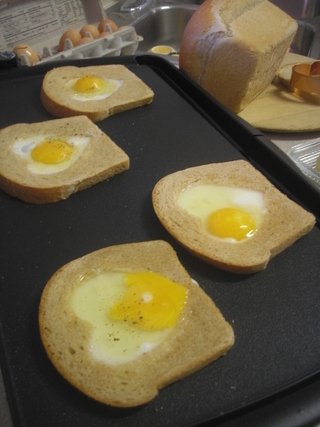 Follow the mixing and baking instructions at the beginning of the post! 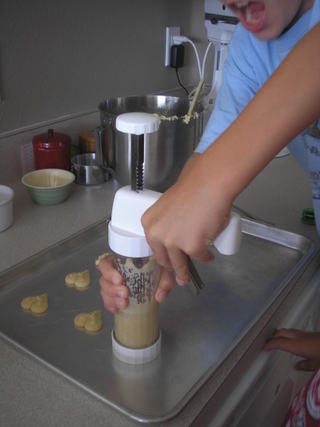 Now, the cookie gun is actually called a cookie press and ours is like this one. 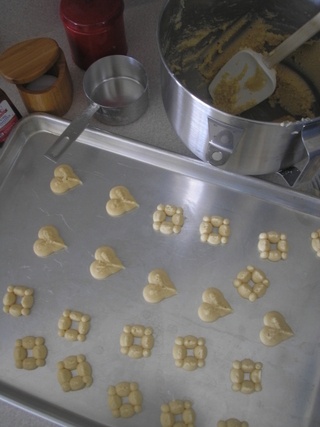 We followed the recipe for Vanilla Cookies that came in the box. Yummy. Is a little baking in your weekend plan? 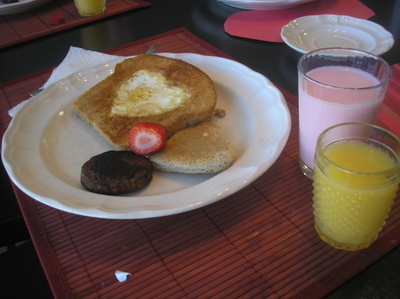 One Valentine's Day morning, about, oh, I'd say six years ago, I made this for breakfast. And that was that. A new tradition was, at that moment, cast in stone. 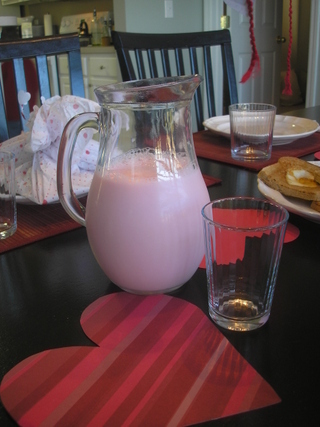 Every Valentine's Day morning from that day forward was to begin this way. A little boy said so. 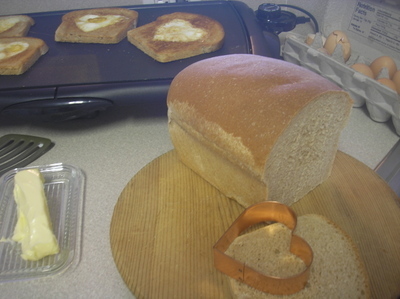 A heart cut from the center of a slice of bread becomes just the right shape for Valentine's Day toast, and the hole left in the slice is perfect to crack an egg into on the griddle. Scoot up close, lick your chops, and dig in. 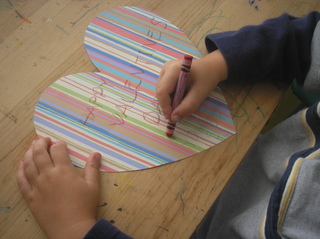 A note, filled with hearts, ready to be sent to a girl! 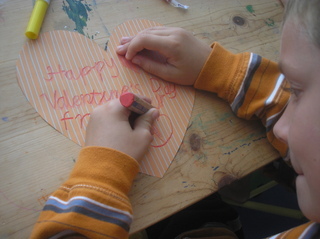 Valentine's Day is coming, you know, and when the mama in the house has been busy all week with a writing assignment and hasn't had time to come up with her own Valentine ideas, where should she turn? This one caught my eye. 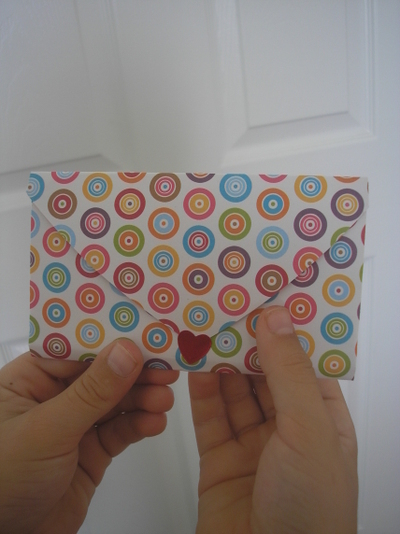 It was a perfect idea for three boys to make for their secret pen pals this month. When they signed up to be secret pen pals last fall, the boys just happened to get paired up with three girls, which they weren't too keen on at first. They just weren't sure what to do with girl pen pals. I mean, how many flowers, rainbows, and butterflies can a boy draw, anyway? 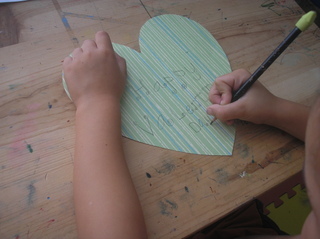 Needless to say, every month when it is pen pal card-making time, there is alot of head scratching going on around here. But on Valentine's Day it's a different story. The pink-y and purple-y colors that usually make the fellas cringe, are the top choice for one day, and one day only. They even get fancy with their handwriting. And this one tries extra hard to stay on the letter 'trails'. 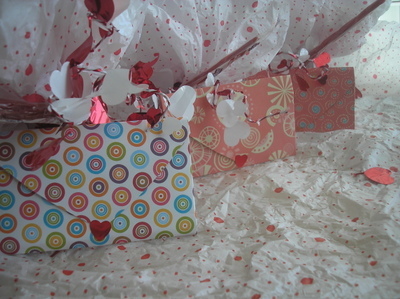 wrap them all up in tissue paper, and Ta-Da! 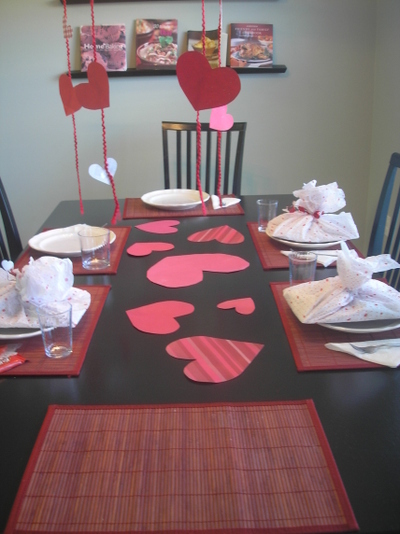 There they have Valentines and treats for three sweet little girls. 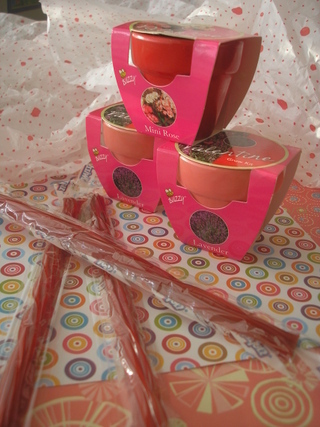 From three sweet little boys.